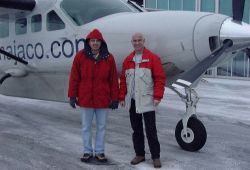 September 10, 2000: Amer Khashoggi and Joachim Wirths will be doing flight training for the next week on emergency procedures and unusual procedures with the Najaco Cessna Grand Caravan. The training includes: Aircraft Systems and Aircraft Checks in accordance to useful checklists; VFR Air work Training with real Emergency simulations; Local Area IFR Training; Flying in bad weather; Flying in mountainous terrain; Takeoffs and Landing on short strips; Low level flights below 50 ft; High altitude flight (FL 250) with oxygen; and de-ice system training. The purpose of this training is to prepare Capt. Amer Khashoggi for his world flight. Advanced Aviation prepared Mr. Amer Khashoggi for his exciting adventure! His intention is, to fly with a C 208 around the world with a landing in every country of our mother earth! Mr. Khashoggi is a very good pilot and he received a special flight training from us to be well prepared for his big event.